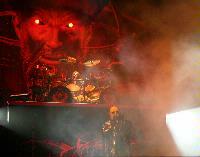 Heaven & Hell was surely an appropriate band to see on this night, because that's what I had to move to get time off from work and attend the show. Of all the big tours to see this year, there was never any doubt that this would be the pick of the bunch so I finagled my way out of work early and made the long, dusty trek through suburban Chicago to the infamous Tinley Park concert venue, which has been much maligned throughout the years. This was my first time to the venue and while the journey there was long and expensive, I found the place more than acceptable. 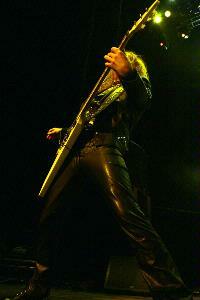 As the pastel colors of a gorgeous sunset faded into darkness, the crowd awaited the arrival of Judas Priest. These guys would have to put on the show of their lives to surpass what we just got from Heaven and Hell. Priest rose to the occasion magnificently. I'm not sure if this was the best of the many times I have seen them. I remember a tremendous show at Alpine Valley in 1984 that made me feel like I could crush boulders bare-handed...but the magic was there. 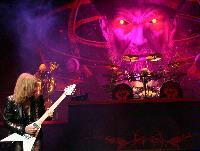 Under the brooding gaze of the seer Nostradamus, the band took to the stage with "Prophecy,” one of the best tracks from their new double CD devoted to the French prophet. It was the only track tonight from that somewhat controversial effort and it was awesome. Gary Hill told me he thought it was even better than the recorded version. 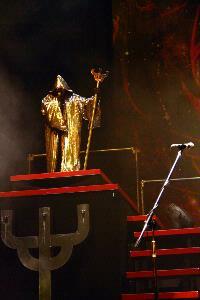 Covered in a shining silver robe and carrying a mystic staff, Halford stalked the stage in regal fashion, barking out the chorus of "I am Nostradamus/Do you believe?" 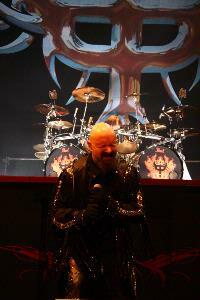 Halford was a hundred percent on his game this night and full of energy....a contrast to the last time I saw him in Rockford, when he seemed physically exhausted by the end of the night. Priest finally have realized that their set needed some changes....hoary old standards have been dropped and rarities have been inserted. 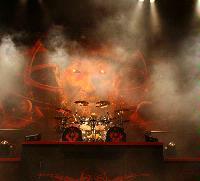 "Eat Me Alive" had all the furious thrashing energy of Testament and more. Then the band really mixed things up with "Between the Hammer and the Anvil" and "Hell Patrol" from Painkiller. The freshness and heaviness of these tracks energized the crowd as well as the band. The Priest held us all in the palm of their hand. Familiar cuts like "Breaking the Law" and "Electric Eye" didn't seem so tired when put next to stuff like "Dissident Aggressor" and a raging "Devil's Child.” The only real lull in the action came with the heartfelt ballad "Angel". So sincere were Halford's vocals and so pure and clear was the guitar work of Downing and Tipton that the song didn't mar the set at all, but demonstrated that Judas Priest can deliver emotion with more than just screaming metal. 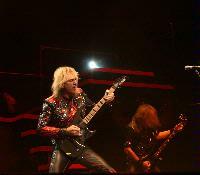 I swear they got even more intense as the set wore on, with "Rock Hard, Ride Free" came across better live than on record and "Painkiller" found Halford bent over double in near agony as he emitted an amazing variety of shrieks and screams.. Halford also did his usual "yeah yeah yeah yeah" call-and-response with the crowd and seemed overwhelmed by the response. This is the rare show where performer and fans fuse together into one unit. It was a terrific experience. The band did trot out "You've Got Another Thing Coming" as their last song, but dispensed at last with "Living After Midnight.” Every cut was a gem and performed with maximum power and professionalism. This is heavy metal! No one hungry for metal could have left this show wanting more. It was a great night and fun was had by all. Wait for the DVD...I hope they were filming this night!